Apple has a demo for IOS called SquareCam which shows how to use AVCaptureStillImageOutput and CIFaceDetector from Apple’s CoreImage library. Basically it is a camera app that then does facial detection and draws a square around faces that are detected in the photo. Christen Blom-Dahl has a blog post up where he converts the SquareCam demo from Xcode to Delphi XE5 Firemonkey for IOS. He states that is goal with building this demo was to explore accessing advanced Objective-C libraries with Delphi XE5 and I think he succeeded. Full source code is available for the Firemonkey version of the SquareCam demo. Check out the original SquareCam demo page from Apple. Update: The demo does face detection and not facial recognition. 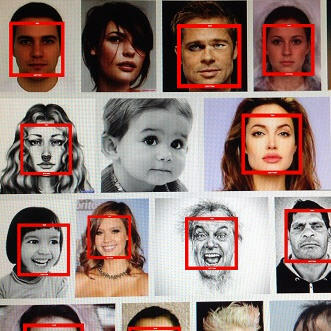 You could do facial recognition with the data from the face detection. Read Christen’s full page write up of how he converted the demo. Access the SquareCam demo source on Github.